Vatileaks. A second outcome, and waiting for the next trial The Vatican is steadily becoming more and more transparent. Proof of it is the appointment of an international expert to head its Authority for Financial Information. As is often the case, we need to go back in time to understand why the Congregation for Catholic Education manages seminars. In the 19th century, after the French Revolution, the Church was on the defensive, as revolutionary movements wanted religion set aside, in the name of the principle of laity. In Italy, the Church was depicted as a hurdle to the unification of the country. It is well known that all of the main characters of the Italian Risorgimento were masons and anti-clericals. Their task was not only to sweep away the Pontifical State. They wanted to put the moral teachings of the Church aside, in order to have the cultural influence of the Church –the only truly unified cultural institution in Italy– wither away. They were all cognizant of the Church’s cultural supremacy. Everybody studied in the schools managed by priests, since they were universally considered the best schools in Italy. So, besieged, the Church decided to fight this battle armed with one of its best weapons: culture. Thus, seminars were put under the administration of the Congregation for Catholic Education. Marginalized and with no properties to rely on (since the properties of monasteries had been taken away by states), Catholic priests were trained to use culture to face hurdles. True, Catholics were excluded from public life, or they were just marginally part of it. But where it was a matter of culture, skills, and reasoning, they had to be prepared to be front and center. This approach was not only crucial in helping the Church survive, it was also the thrust for Catholic-inspired political movements. It was also the laboratory where the Social Doctrine of the Church grew, from the starting point of Pope Leo XIII’s encyclical Rerum Novarum. It was, ultimately, the path the Church laid to respond to the challenges of the time, thus preparing it to the great renewal of the Second Vatican Council. Today, the Church seems to be moving backwards. Cardinal Mauro Piacenza, Prefect of the Congregation for the Clergy, fought hard to have the seminaries placed under his dicastery. In a 15 page dossier, he maintained that spirituality had gone missing in seminaries, and that his Congregation was the best suited to bring them back to a more spiritual path. The Congregation for Catholic Education has thus been deprived of one of the reasons for its own being. Now, the challenge of culture lies just with Pontifical Universities, and no longer pertains to seminaries. The Church risks retreating to the sacristies, and having no cultural impact on the public arena. A Pontificate under internal attack? Is this what Benedict XVI really wants? If we look at his Pontificate, he always talked about the importance of the role of religion in society. He spoke several times about “positive laity”, he asked for a new generation of Catholic-inspired politicians in diverse occasions, he also warned from relegating faith to the private life. So why did he accept cardinal Piacenza issues? Why was he not aware of the risks – in terms of cultural impact – of his final decision? 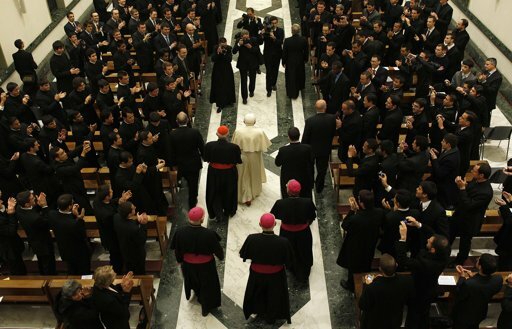 The first impression – now that the first trial on Vatileaks has come to an end, and the second one is beginning – is that we are dealing with a Pope not able to manage the Curia, or – worse – to a blackmailed Papacy. Let us look at his Pontificate. Benedict XVI seems to be a two-speed Pope. He is not clericalist, nor is his staff. The Pope was educated in German Schools of Theology –in state-run, not pontifical, universities– where the cultural debate is strong and where there is no clericalism. As soon as he was elected Pope, he pushes for changes. One of his first decisions was the promotion (a promoveatur ut amoveatur, promote to remove, decision) of Leonardo Sandri. Sandri was the number two of the former Secretary of State Angelo Sodano. Benedict XVI created him cardinal and appointed him Prefect of the Congregation for Oriental Churches. Then, the Pope promulgated the decree that changed the admission criteria for seminaries, and made the Pontifical Council for Interreligious Dialogue (whose number one, Fitzgerald, was appointed nuncio to Egypt) a department of the Pontifical Council for Culture. Finally, he began to search for a new Secretary of State to take the place of Cardinal Angelo Sodano, who would have never been loyal to the Pope. This activism brought on problems. At first, Sodano tried –through the then Papal nuncio to Italy, Paolo Romeo, now archbishop of Palermo– to “direct” the appointment of the successor of Cardinal Camillo Ruini as President of the Italian Bishops’ Conference. When this maneuver failed, Sodano began to resort to news leaks to favor the selection of a person close to him for this same position. Benedict XVI then took an unprecedented decision: he announced the name of his new Secretary of State (Card. Tarcisio Bertone), but allows Sodano to remain at his post for another three months. A tactical error. In three months, Sodano was able to push for the appointment of the new director of the Holy See Press Office, replacing the hated Joaquin Navarro-Valls with father Federico Lombardi; he reinstituted the figure of the Prelate in the ranks of the IOR (the Vatican’s Trust Fund), appointing his loyal Piero Pioppo to the post; and, finally, he didn’t move a finger to avoid the media disaster arising from the Pope’s lectio magistralis in Regensburg. Unluckily for Sodano, this controversy turned into an unexpected success for Benedict XVI, who used it to restart a seemingly moribund dialogue with Islam. Nevertheless, what happened in Regensburg was a warning: Benedict XVI could be lead into trouble anytime. That there was trouble on the horizon, anyway, was evident from the very Conclave that elected Benedict XVI pope. According to credible reports, even when it was clear that Joseph Ratzinger would be elected pope, between 20 or 30 cardinals obstinately voted against him. In the unwritten language of the Curia, this had a specific meaning: not everybody wants you as a Pope, so beware. Benedict XVI’s second speed comes after Regensburg. It is a more prudent speed. The Pope restores to its former rank the Pontifical Council for Interreligious Dialogue. As its head, the Pope appoints Cardinal Jean Louis Tauran, a skilled diplomat. To change the Curial organizational chart, Benedict XVI awaits for the right moment. Officials of the Secretariat of State – unfriendly to Bertone – are replaced one by one when their mandates expire, and are appointed Papal nuncios. The Pope resumes his plan, intended to bring the Church back to God. The Pope’s speeches during his trips mark a crescendo on this topic, and the Papal catechesis and homilies are precious in this same regard. It is a hidden magisterium, since it is rarely highlighted in the media. But it is a clear and steady magisterium. 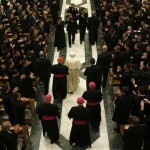 But the Pope is as close to issues of faith as he is far from the governance of the Church. The Vatican is often about nuances, more about words than choices. Benedict XVI did not catch these nuances (he was part of the Curia, but not an active participant in it), and neither did Bertone. Many can influence in one way or another how the Church is governed. Each point of view is taken into account, oblivious to the possibility that some may not be acting on good faith. The hiring of Paolo Gabriele, the butler convicted for stealing and leaking Papal documents, is symptomatic. The Vatileaks scandal was the contingency that has brought about the return of Benedict XVI’s adversaries – i.e. the Old Guard– to the helm. They ably seized on the occasion. Vatileaks was in fact, in some ways, propitiated –but not foreseen- by Benedict XVI’s enemies. An evident sign was the decision to give the rights for the Pope’s new book on Jesus of Nazareth to Rizzoli, a lay publishing house. The choice was promoted by elements of the Old Guard in the Curia, and no one was able to confront this decision on behalf of the protection and promotion of the Catholic “good press”. Now, rumors about John Michael Harvey’s successor to the post of Prefect of the Pontifical Household have shed light on the return to influence and important positions of men from the old guard. The Head of Protocol in the Secretariat of State, Msgr. Fortunatus Nwachukwu, may become Papal nuncio in Uganda, part of a change that may also include Msgr. Thevenin, who is very close to Card. Bertone. It is the first time that Msgr. Nwachukwu is mentioned as departing, a transfer that would be a cause for concern. Is the old guard returning to power? This way, the old guard is in some ways returning to power. This Church lacks management. This Church above all lacks prophetic vision. It suffices to read the document issued in 1986 by the Pontifical Council for Justice on international debt, which premises are still valid today, and that depicted an economic panorama just like the one we have today. Nowadays, the Pontifical Council for Justice and Peace seems to be under bureaucrats rather than visionaries, its prophetic impulses diminished (as in the message for the most recent World Peace Day), and its international impact questioned. In a system in which the bureaucracy counts more than ever, we must ask: has the old boy’s club approach to hiring worked? Not much. If we take as a reference the 1986 document about debt, we discover that all who were behind it came from the Paul VI era. And so one could conclude that John Paul II’s 27 years of pontificate were indeed years of splendor for the image of the Church, but they also were years during which the Curial machine came to a grinding halt at the hands of the various bureaucrats who believed more in facades and money than in prophecy. They are the very same bureaucrats who have now taken the oversight of seminaries away from the Congregation for Catholic Education. There is, no doubt, a cultural emergency, and the Pope always speaks about the need for a strong presence of faith in the public arena. But the Vatican bureaucrats prefer a Church secluded in temples, and not speaking out loud in the public square. They don’t even remember that a parish priest must not only be full of faith and precise in liturgy. He must also be the social heart of his parish. He must be theologian and pastor, well-rounded and approachable. This fullness is what has been missing in the formation of priests. Not even the strongest supporters of Catholic tradition –those who advocate for a return to a pre-council liturgy– have understood that they are lowering the Church’s prophetic force. They leave religions at the mercy of states’ decisions, and they do not safeguard true religious freedom. In fact, the Holy See is the only “religion” with a structure that is recognized in International Organizations. The only independent and sovereign religion (religions without a state to guarantee their independence depend on the states in which they are based). The only religion that can independently fund its missions, through Propaganda Fide and the IOR. Helping the faithful in the world – even financially– is part of the mission of the Church. Also part of the mission of the Church is the diplomatic effort to protect religious freedom, life, and to promote social initiatives in favor of the poor and weak. This mission seems to be forgotten. One Response to Does the Church lack prophetic vision?